Nutritious and protein rich, masoor daal is cooked and consumed almost daily as a basic diet in homes all over south Asia. We describe a general cooking procedure of this vegetarian dish as followed in a typical Bengali kitchen. 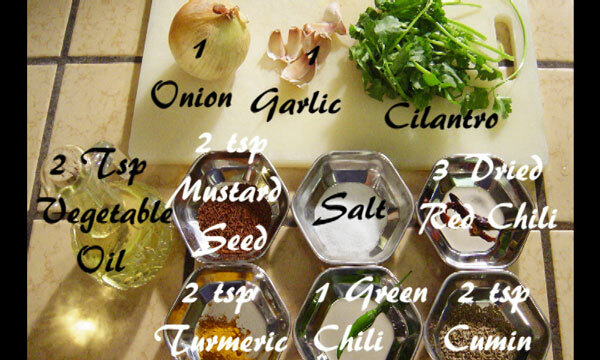 The cooking consists of three steps. 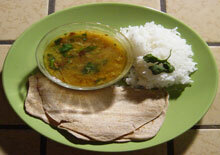 In the first step, the masoor daal is boiled till it softens. In the second step, usually done side by side as the bean is boiling, the spices are fried in a pan. And finally, the fried spices are mixed with the boiled masoor bean. 1. Measure 2 cups of split masoor bean in a large container. Masoor bean is available in any Indian or south Asian grocery store. Wash it twice with water and then put the pan on a stove at high heat. As the water starts to simmer, turn the heat to a low level and cover the pan. Keep eye on it as the water may boil over. If that happens, temporarily open the lid. 2. Clean and mince the cloves from one whole garlic. 3. Chop a whole onion. 5. Stir the masoor daal every now and then as it is boiling. This will keep it from sticking at the bottom of the pan and burn. 6. Put oil to a medium hot pan. 6a. And as the oil gets heated, add the cumin. 6b. Then add the mustard seed. 6c. Add the red chili. 6d. Add the chopped onion. 6e. Add the minced garlic. 6f. Stir them well till the whole mass becomes golden brown. 7. As the masoor daal softens, add the salt, the turmeric and the green chili. 8. Then add the whole fried onion mixture into the boiled masoor daal. Stir them well. 9. Add the chopped cilantro into the daal and stir. This completes the Masoor Daal or the lentil preparation. It takes about an hour and serves about four to six people. The lentil can be served as a soup by itself. Or it can be served with rice and chapatti as in an traditional Indian meal.